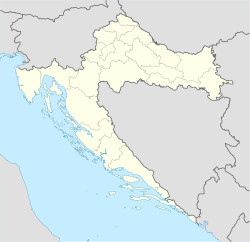 Donji Srb (Serbian Cyrillic: Доњи Срб) is a village and former settlement in Croatia. Till 2011 census, Donji Srb was independent settlement. It was unified with settlement of Gornji Srb in new settlement of Srb. As independent settlement it included hamlets of Ajderovac, Donji Srb, Kruškovača and Podastrana. Note: Settlements of Donji Srb and Gornji Srb are administratively recognized as independent settlements in 1890 and 1900, and then from 1948-2001. From 1857-1880, and 1910-1931 it was part of that time independent settlement of Srb, for which it include data. In 2011 it finished its existence as independent settlement and became part of newformed settlement of Srb. Note: In 1910 census include data for former settlement of Gornji Srb.